ForOffPc is a free software that lets the user restart, shut down, logoff, hibernate, and stand by the PC at a chosen date and time. It is a simple and very light software and takes very less time to download and install. It has been developed and released by EVVAsoft. It comes with two cool skins – white and metal. The color of the font also can be changed to suit the theme of windows. This scheduled shutdown/restart is a feature of WinUtilities too. Using the software is very easy. First select the task according to your need – restart, shut down, or others. The two tasks restart and shut down have to be selected separately. Go ahead and select the date on which you want the task to be performed. Once that is done, select the time – hours, minutes and seconds. If it is a onetime task, you can click OK and the task will be saved. If you want it to repeat over some period, choose Repeat and select the desired period from hourly, daily, weekly, monthly or yearly. What makes this freeware a winner is the convenience in its usage, its simplicity, straightforward interface, and the ease of scheduling multiple tasks. One more feature that makes it stand out is that it’s very clean – no bugs whatsoever. 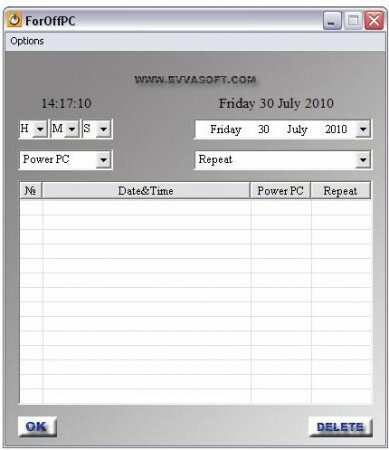 A practical use of such a software is to schedule shutdowns in your office computer. So, if you forget to shutdown your computer, this shutdown scheduler will take care of that. But don’t do that if you plan to remotely connect to office PC. You can choose the exact time and date when you want the PC to restart or shut down. It can be set for a one time execution or a frequency can be set – it can be hourly, daily, weekly, monthly or yearly. Once set, the action to be performed can be edited by going to the window list tasks. The software can run on windows or can be minimized to system tray. It can be set up to start with windows start up. Editing a scheduled task is very easy. Just double click the left mouse button on the selected task in the window listing of the tasks. The box will become empty; you can make the necessary changes and click OK. It’s done. The task has been modified. To delete a task, select from the window list and click Delete. Overall it’s a very handy and effective software that lets the user actually plan his/her schedule. It can be downloaded free of cost. ForOffPC is a free software that enables the user to plan and execute the system restart and shut down. It’s very easy to use and is superlight. Released by EVVAsoft, it is available for free download at their site.